With a heart to support the Women's Group in Latiboliere, the St. Mary's women reflected as they prepared for a trip to Haiti. It was decided that they would sell raffle tickets for a quilt donated by Marianne Skrobiak. $1700.00 American dollars was collected. In communication with the Women's Group in Latiboliere, it was decided that the money would be used to purchase goats. Upon their arrival in Latiboliere, the St. Mary's women were greeted with the sight, sound, and smell of many goats. What joy it brought to our hearts to see the pride in the women as they showed off their new treasure. Even more astonishing was the circle of smiling women waiting to greet us with bouquets of flowers, songs, prayers, dance, and hugs. The outpouring of love and gratitude was overwhelming. A source of sustainable nourishment for families. Each of the 54 women in the women's group received one female goat. Goats are used for breeding and food. The first born kid, if female, goes to a woman in one of the chapels or villages of Latiboliere. If it's a male, they raise it, take it to Jeremie to sell, buy a female and give it to another community member. If additional kids are born to their goat, they are allowed to keep them. To remain healthy, goats require vaccinations. These are purchased with donations from the St. Mary Women's Group. Extra funds are needed to purchase additional goats for other families. 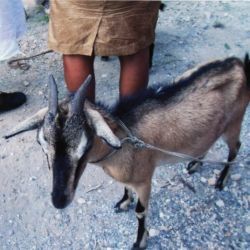 The price of a goat is approximately 1250 Haitian goudes or about $30 US dollars. We send our love over the mountains, we send our love over the seas, we send our love into the Heavens, and it returns and lives within each of us. Our hearts are forever connected.